A former architect, Chicago's Adam Reed Tucker now builds LEGO® structures of iconic, engineering marvels. Who built Brick by Brick's large-scale LEGO® recreations of architectural wonders? At the age of five, Adam Reed Tucker visited the Museum of Science + Industry Chicago where his aunt, a civil engineer, bought him one of his first LEGO sets at the Museum’s store. His love of the brick continued for many years of his childhood. After practicing as a professional architect in Chicagoland for 10 years, Adam returned to his love of LEGO in 2002, when one day he filled multiple shopping carts with various sets, and began to experiment with them as a medium for architectural art. His work attracted the attention of The LEGO Group and in 2007, he became a LEGO® Certified Professional—one of only 13 currently in the world. LCPs are not LEGO employees, but are trusted business partners chosen for their building proficiency, enthusiasm for LEGO, and professional approach to the brand. 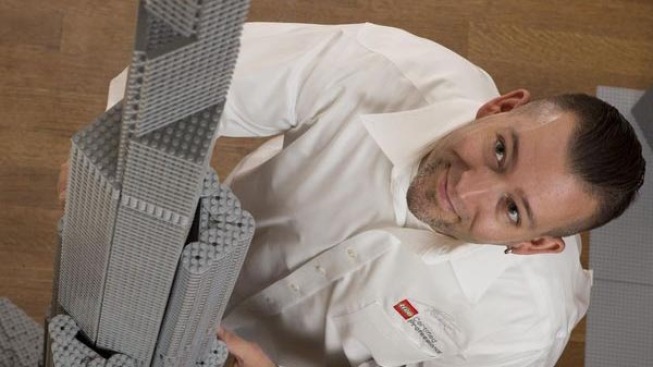 In 2008, he worked with the company to conceive and design the LEGO Architecture Series. Each set contains the pieces and instructions to build a model of a famous architectural building in micro-scale. Tucker begins the design and build process of each structure by examining photos, elevations and artist renderings. As an artist and architect, he considers design principles such as proportion, scale, form and aesthetic. His pieces are “scratch-built,” meaning that Tucker doesn’t use computer modeling, pencil and paper or written directions in his work. Tucker has built and rebuilt certain sections of buildings five or six times until he feels they are right. Now more than a dozen of Adam's spectacular constructions — including a 60-foot Golden Gate Bridge, the International Space Station and Roman Colosseum — are on display in MSI's latest exhibit, Brick by Brick.